The manganese liners have been temporarily fitted to the hornblocks in the chassis for the centre axle whilst further measurements were taken with a micrometer and now the appropriate axleboxes are on the milling machine preparing the horn surfaces for welding on of the liners. 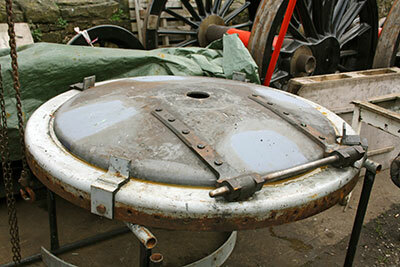 The smokebox door has had the hinges fitted albeit with temporary bolts and the hinge pin lugs fitted to the front ring. The bolts need to be exchanged for rivets, hand rail pillars fitted and inner liner and central boss fitted before the door itself is considered something like complete and work can progress towards riveting the front ring to the smokebox wrapper. 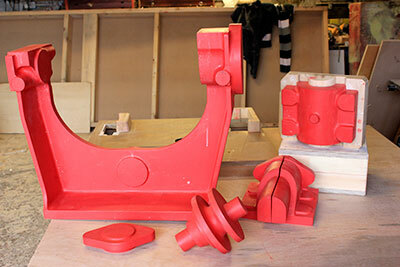 The latter has received another coat of paint and the new Wakefield lubricators have also been painted black. Further progress has been made with the cylinder cladding sheets. The reversing mechanism in the cab is quite a complex component in its own right and patterns have been made for the cast components. 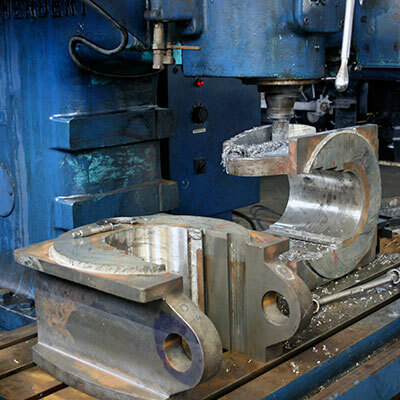 There is a lot of machining involved in the whole component and we shall be out sourcing this in order for continuity and a reasonable time scale. Don't forget that the date is fast approaching, so please try and make it to Kidderminster Railway Museum for a 2.00 p.m. start on Saturday 8th April. There will be plenty to tell you, and questions, as well as positive suggestions, are welcome. We will try to handle the business with as much despatch as possible, and should be finished by 4.00 at the very latest. Hope to see you there! On Friday 6th October, the Trust is running a special train in memory of Paul Anderson, who died on January 17th (Paul's obituary appeared in January’s notes). As many of you will know, Paul was a fireman at Nine Elms in the 1960's, working out of Waterloo on everything from the big Merchant Navy Class 8P Pacifics to the numerous 82XXX tanks which finished their days in and around the former LSWR terminus. One of the things he was most looking forward to was firing 82045 when it enters service on the SVR, a solemn promise I'd made to him some years ago. Paul was laid to rest at the end of January on a murky, drizzly afternoon at Halifax's Stoney Royd Cemetery. A native of South London, he had asked for Ray Davies's unforgettable 1967 hit "Waterloo Sunset" to be played at the simple ceremony, and so this is the name we have chosen for the train. The SR-style headboard will read WATERLOO SUNSET with, underneath, Paul Lawrence Anderson 1945-2017. The special will consist of one round trip Bridgnorth-Kidderminster and will be hauled by an appropriate locomotive. There will be a three-hour stopover at Kidderminster, during which we hope to surprise you with some nice jollies. Paul was one of my dearest friends and an exuberant character, and would be delighted that proceeds from the event are to kick-start the 82045 Future Account, a money pot which we are establishing in order to ensure that funds will always be available to look after the new loco's future well-being after it has entered service. Ticket price has been fixed at £30, and you can reserve yours by completing this booking form and sending with a stamped addressed envelope, with your cheque - made out to The 82045 Steam Locomotive Trust - to Barbara Massau, 4 Southfield, Prestbury, Cheshire SK10 4XF. 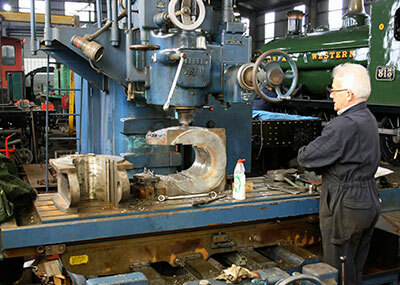 The centre driving wheel axleboxes on the large Herbert milling machine, the horn faces being prepared for the welding on of the manganese liners. Photo: Tony Massau. Richard Fraser in charge of machining the centre driving wheel axleboxes. Photo: Tony Massau. The smokebox door with hinges bolted on. Photo: Tony Massau. 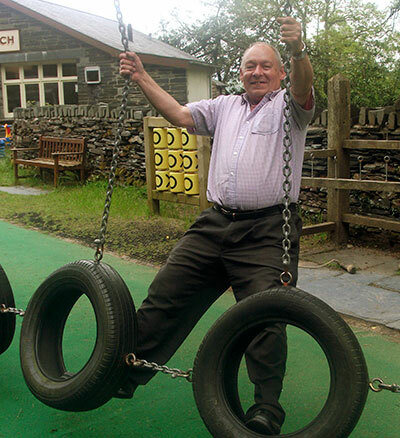 Paul Anderson testing out the tyres in the children’s play area next to the cafe at Tan-y-Bwlch station on the Ffestiniog Railway, May 2012. Photo taken by Paul's partner, Joanne Mills.